DuPage, Kendall, Will, Grundy, Kankakee, Iroquois and Ford. Previously, DuPage, Will, Kankakee and Grundy counties were under the Archdiocese of Chicago; Ford and Iroquois were under the jurisdiction ofthe Peoria diocese, and Kendall County was in the Rockford Diocese. Joliet became the fifth diocese to be created in Illinois and the 101st to be established in the United States. The Diocese of Joliet is approximately 110 miles long and 60 miles wide, extending from Roselle and Bensenville in the northern section of DuPage County to Gibson City and Paxton in the southern part of Ford County and from Wayne and Kinsman near the western line of the seven counties to Elmhurst on the Cook County line and Hopkins Park, near the Illinois-Indiana border in the east. Although the decree was issued in 1948, the Joliet Diocese was not canonically created until March 24, 1949, when a white-haired, soft-spoken priest named Martin D. McNamara was installed as the first bishop of the diocese by Samuel Cardinal Stritch, Archbishop of Chicago, in ceremonies at the old St. Raymond’s Church in Joliet. The “Castle” at 310 Bridge Street became the Bishop’s first residence in the new diocese. It had been a residence hall for students of the College of St. Francis until the Sisters of St. Francis of Mary Immaculate offered the castle to the Bishop for living quarters. Bishop McNamara moved into his new home on the day before the installation ceremony. Shortly after he arrived at his residence, the Bishop was joined by Fr. Romeo Blanchette, a Chicago priest and canonist, who was “loaned” by Cardinal Stritch to the new diocese for one year, as the new diocese had no canon lawyers. Fr. Blanchette would spend the rest of his life in the Joliet Diocese, eventually serving as the second bishop of the diocese. Divine Providence could not have chosen a better team to lead the diocese in its early years. Bishop McNamara, a patient, humorous, kindly priest, and his Chancellor and Vicar General, Fr. Blanchette, an affable priest and brilliant scholar with an eye for detail, would do well together in pioneering the building of the diocese. 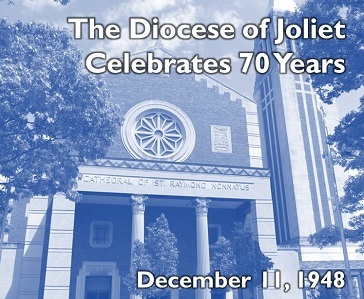 The Diocese of Joliet was created in 1949 to meet a need. This was the post-World II era. Veterans were filling up the schools and universities. Industries, which had grown rapidly to meet the needs of a nation at war, continued to thrive. Once-sleepy farm towns became suburban developments, and many hamlets became cities. The Joliet area felt the rapid growth. Where once the city of Chicago had been the center of population, now the trend was shifting to the areas outside of the city. Joliet, a city of businesses and industries, felt the growth as families moved out from Chicago, and others, uprooted by the fortunes of war, came from Europe to begin a new life in a new land. The Catholic Church saw this growth and realized that there would have to be a separate diocese created to meet the needs of the people; parishes would have to be established and schools built. There was work to be done and 1949 was the time to begin it. St. Raymond Church in Joliet was named the Cathedral. This church building was, however, inadequate to fulfill the requirements of a Cathedral for it had a limited seating capacity of 540. In 1950, Bishop McNamara decided that a new Cathedral should be built; plans were formulated and a goal of $2 million set for its construction. By May of 1950 there were 500 clerical and lay leaders in 72 parishes participating in the Cathedral fund drive. The drive served as a unifying force in the fledging diocese. It formed a common bond and was a source of pride throughout the diocese. It gave priests, religious and laity a sense of belonging. The Cathedral of St. Raymond Nonnatus was formally dedicated on May 26,1955. The name derives from the great St. Raymond Nonnatus, who was a cardinal of the Church during the 13th Century. “Nonnatus” comes from two Latin words “non” and “natus” meaning not born. It is believed that St. Raymond was taken from his mother’s body after she died in labor. Those who came to the dedication found an imposing structure. The Cathedral has a seating capacity of 1,200; is sixty feet high, with a bell tower rising 287 feet. The bell tower houses a library and adjoins the main building, which was modeled on North Italian Renaissance style. Samuel Cardinal Stritch led the dedication procession which included five archbishops, 14 bishops and three abbots with clergy, religious and lay people from throughout the area. The completion of the Cathedral marked a milestone in the initial growth ofthe diocese. In 1949, the Catholic population in the diocese was 90,544, but by 1955 it had climbed to 122,416. The Catholic school enrollment increased to22,917 children from 12,807 youngsters in 1949. Sixteen new grammar schools had been built; an addition had been made to Immaculate Conception High School, a co-educational institution in Elmhurst, and Maryknoll College in Glen Ellyn, the training ground for future Maryknoll missioners, was completing its sixth year. The number of diocesan priests in the diocese increased to 110 from 85 in six years, and religious order priests rose to 169 from 130 during the same period. Throughout the diocese churches, convents, rectories and schools were either newly built, or additions made to existing facilities. Diocesan building growth was estimated at $4 million a year. The late fifties and early sixties were years of accelerated growth for the diocese. It was during this period that fund drives were held for St. Charles Borromeo Seminary, Lockport; St. Francis High School, Wheaton; Montini High School, Lombard; Driscoll High School, Addison; Bishop McNamara High School, Kankakee, and St. Joseph Hospital, Joliet. Attendance increased in the schools throughout the diocese with parishes being formed at the rate of two or three a year. The diocese, wherever feasible, continued to establish churches and schools. And the vocations to the priesthood and the religious life continued to flourish. The Chancery, which had begun in a one-room office on the third floor of the Joliet Building, was now in the “Castle” at 310 Bridge Street. Later on, the Chancery would have its own modern building at 425 Summit Street. It was a dream of Bishop McNamara for the Joliet Diocese to have its own minor seminary to help provide priests to serve the ever-growing Catholic and on February 5, 1963, he announced the founding St. Charles Borromeo Seminary. After a very successful fundraising campaign, ground was broken for the building in March of 1964 and Bishop McNamara laid the cornerstone in October of that year. The high school and college seminary opened in the fall of 1965. The beautiful seminary facility was officially dedicated on May 15, 1966, by Archbishop John P. Cody of Chicago, just eight days before the death of Bishop McNamara, who was too ill to be present. Unfortunately, the decline in the number of priestly vocations began to be felt in the years just after the seminary was opened. The college seminary program closed in 1972 and the high school program ceased operation in 1980. Up until January, 2014, the seminary building served the diocese as a Pastoral Center, housing many of the diocese’s offices and agencies. When Pope John XXIII called the Second Vatican Council in 1962, Bishop McNamara, along with his colleagues throughout the world, went to Rome. But he no sooner arrived than he became ill and had to return home, never to go back to the Council which ended its deliberations in 1965. So now the full task of guiding the direction of the diocese fell on Monsignor Blanchette, as Vicar General, having received that appointment in 1950. On April 3, 1965, he was appointed auxiliary bishop and apostolic administrator. He was consecrated a bishop by the Apostolic Delegate, Archbishop Egidio Vagnozzi on April 3, 1965. After his appointment, Bishop Blanchette attended the last session of the Second Vatican Council. On May 23, 1966 Bishop McNamara died and Bishop Blanchette was selected Diocesan Administrator. The funeral mass was held on May 27 in the Cathedral of St. Raymond with the Most Rev. John P. Cody, Archbishop of Chicago, as the principal celebrant. The eulogy was delivered by the Most Rev. William Cousins, Archbishop of Milwaukee. When he came to Joliet, Bishop McNamara had chosen as his motto, “Lord that I may serve.” It was indeed an appropriate one for in 1966 the Diocese of Joliet had 270,000 Catholics, making it the second largest diocese in the state. During his stewardship, Bishop McNamara directed the founding of 31 parishes; confirmed more than 30,000 Catholics, and dedicated scores of churches, schools, parish halls, rectories and convents. Bishop McNamara was indeed the good and faithful servant; he was laid to rest in Resurrection Cemetery, Romeoville.